Bouzies is a small village nestled at the confluence of the Lot Valley and Célé Valley, in the heart of the Regional Natural Park of Causses du Quercy. 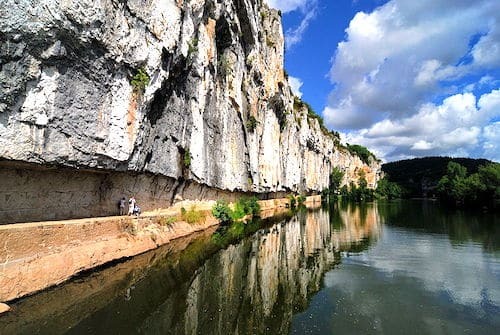 A stone's throw from Quercy popular tourist sites, it is a popular and busy village over the holiday season; Saint-Cirq-Lapopie, Cabrerets and Caves of Pech Merle are only 4kms away and Cahors, the former capital of historic Quercy, a mere 28kms. 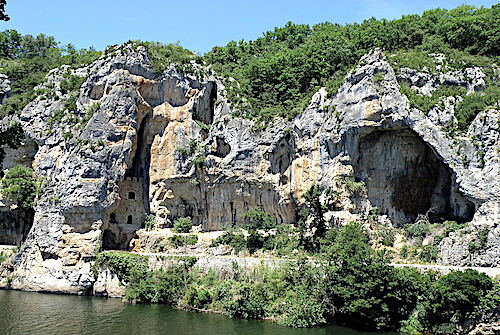 However, Bouzies is a tourist site in its own right because of its spectacular 80m high white limestone cliffs that fall steeply into the river. Our distant ancestors occupied the natural cavities the Lot River carved into the limestone over millennia. Their descendants expanded and adapted these rock shelters into troglodyte dwellings and fortresses, such as the Château des Anglais opposite the village. They initially used the latter as a refuge during the Norman invasions of the 9th century, and transformed it into a fortress during the Hundred Years War. The one-way narrow suspension bridge that links the village to the north bank offers a prime view of the troglodyte fortress. Bouzies’ additional appeal is its prime location, right on the river, that always turned it into a major river navigation site. Commercial shipping is an activity of the past, but it gave way to boating in the 1980s. Several boat companies are now based in the village; they offer cruises in barges (locally known as gabarres), but also boats and canoes rentals. Cruising on the Lot is a fantastic way to discover the river and the spectacular landscapes and villages that dot its banks. However, if boating is not your thing, but hiking is, you’ll enjoy a walk along the old towpath that links Bouzies to Halte Nautique, the port of Saint-Cirq Lapopie. This 15kms round trip walk was named Sur les traces d’André Breton - On the footsteps of André Breton to pay tribute to the surrealist writer who spent several years in Saint-Cirq. Locals built the towpath in 1847, when river shipping was at its height. They excavated the base of the impressive cliffs that border the Lot for about 1km from Bouzies towards Saint-Cirq. This section of the towpath looks like a narrow corridor nestled between rock and water; the rest of the path runs in the open air along meadows and woods. In the old times, men and horses pulled convoys of barges that carried prunes, Cahors wine and wooden barrels to the port of Bordeaux; they brought back items that were not locally produced. Commercial activity stopped in 1926 when the Lot was deemed unsuitable for navigation; however boating was developed in the 1980's to meet green tourism growth. Two locks allowed the old barges to sail upstream; not only do they still work, but they are very useful for modern-day boating. They are still operated manually; boaters have to hand-crank the gates open and closed and scramble up and down steep stone steps to tie their boat. Quite an exercise, but apparently worth the trouble! 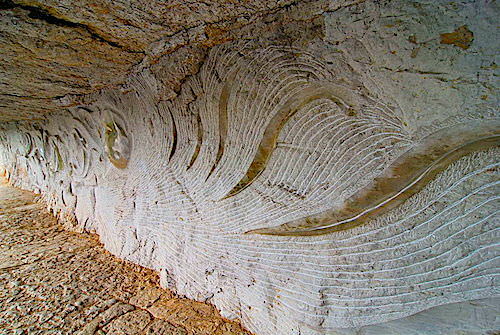 Daniel Monnier, an artist from Toulouse, took advantage of the river revival; he carved a 30m long low-relief in the rock along the towpath near the Ganil Lock; his sculptures illustrate the region’s flora, fauna and many fossils. A walk along the towpath of Bouzies is definitively a walk outside the beaten tracks!